Now in its fourth generation, is the most lunatic AMG saloon of them all still a match for the BMW M3? crankandpiston.com finds out on the international launch in Portugal. Of all the Mercedes-derived AMGs, the C 63 has the reputation for being the most lunatic. As the lightest rear-wheel drive model available, with brutish power and a heavy metal soundtrack, it’s the perfect recipe for luxury German hooliganism, and through each generation since has been an intriguing alternative to BMW’s M3. More than 40,000 third generation C 63s were sold around the world, making it the most successful car in AMG’s history. And now there’s a new one, based on the fourth-generation W205 C-Class. AMG has taken an already accomplished mid-size saloon and worked its brand of beefy magic to give it some serious clout, both on road and on track. 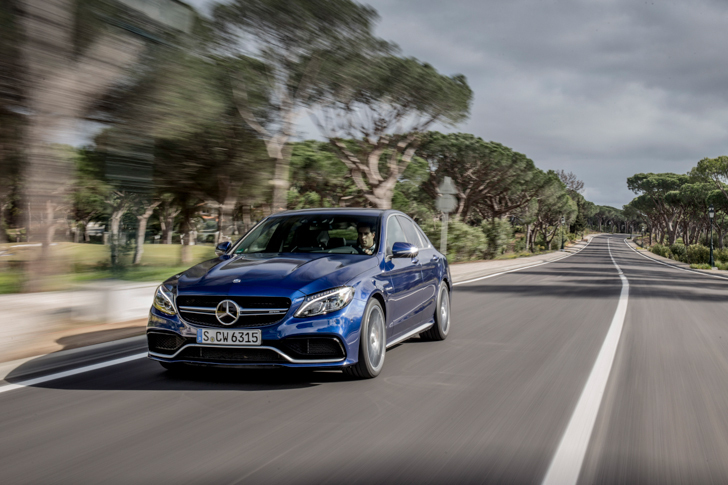 The name of the C 63 comes from its old 6.3-litre, naturally aspirated V8. But that’s been replaced by a twin-turbocharged 4-litre V8 – the same one found in the Mercedes-AMG GT. It’s notable not just for being smaller than the old V8, but also for being quite clever. The turbochargers are wedged in between the two banks of cylinders, which means the whole caboodle can be mounted low down in the car for better performance. Two versions are available. The standard car has 469bhp and 479lb ft. However, we’ve been playing with the top-of-the-line C 63 S, which ups the power output to 503bhp and a stonking 516lb ft of torque. That dwarfs the M3’s 406lb ft, although the BMW is around 50kg lighter. Various flavours of C 63 S are lined up outside the hotel on the international launch in Faro, Portugal, and by gum they look good. The AMG design team is confined to the visual boundaries set by the vanilla C-Class, but they’ve succeeded in making the C 63 look mean without being tacky. The tracks are wider than the standard car, and the wheel arches flared accordingly. The bonnet bulges and the bumper features a grey “A-wing” that serves as an air deflector for the cooling inlets. At the back, a motorsport-style rear diffuser does the same job. Inside, it’s familiar C-Class territory with added steroid. 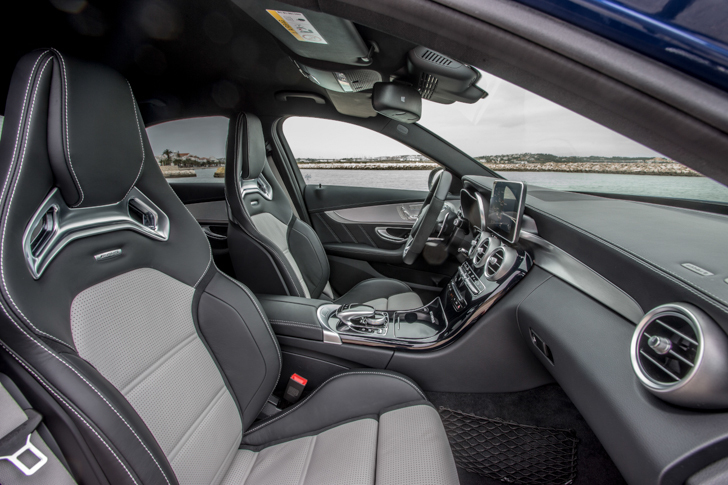 As well as practical and comfort features like the tablet-style centre screen and electric everything, there are hugging sports seats and carbon fibre-backed gauges to remind you that this machine means business. A twist of the key and the V8 starts with a bark. Pootling around town the C 63 S is docile, but even with Comfort mode enabled and the exhaust on its quietest setting, there’s a threatening burble from the back end. The suspension is firm, but damped well enough to dismiss potholes. It’s an entirely comfortable experience, meandering behind mid-morning shoppers in the sunshine, with the only slight hiccup being the seven-speed transmission. At very low speeds, it seems to hesitate from time-to-time, resulting in an embarrassing lurch off the line and an accompanying exhaust snarl. People look. On the highway, a stab of the gas takes us to 130kph almost instantly, accompanied by a glorious flap-assisted exhaust note and a G-force squeeze into the sports seats, but then it settles to an adaptive cruise-controlled canter. Road noise is reasonable, although there’s a noticeable buffeting of wind noise from the wing mirrors. It’s a good excuse to crank up the excellent Burmester stereo. The test route takes us off the highway and onto some exquisite hill roads towards Portimao. It’s time to play. Sport+ mode is selected, which opens the exhaust flaps, ups the transmission speed and stiffens both the suspension and the steering. Instantly, the bellow from the back of the car is louder, more metallic, more evocative. Fears about the reduction in engine size are immediately forgotten; the biturbo V8 is superb, with buckets of torque available and no noticeable lag on the throttle. It takes a few kilometres to realise that there’s no need to skip up and down the gears – the full band of power is usable. 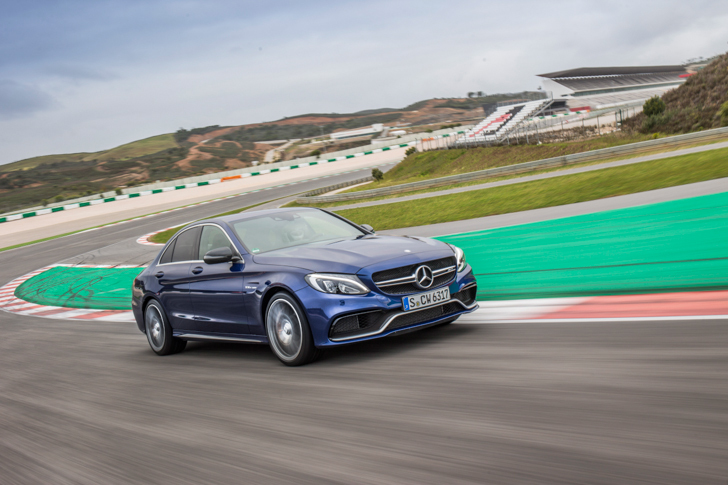 As the road winds left, right, up and down, the C 63 S comes alive, encouraging the driver to lean harder on the Michelin Pilot Sports and dig into the tarmac. The steering is weighty and direct, although some more textured feedback would be nice. With the gearbox set to manual, the hefty wheel-mounted paddles come into play. The changes are fine, although not as instant and smooth as some other models – no twin-clutch cleverness here. However, the slight jolt on each shift actually adds to the visceral experience. Squeeze the throttle, watch the horizon approach at pace, hard on the carbon-ceramic brakes and turn in as the exhausts pop and crackle away. It’s easy, with all that power, to break grip at the back, but feather the throttle on exit and smooth, fast progress is surprisingly accessible. And so to the wonderful Autodrome Internacional Algarve, a peach of a modern circuit that rides crests over the Portuguese landscape. It’s a true test of any car, but one guaranteed to extract maximum excitement if the quality of machine is high enough. It is. 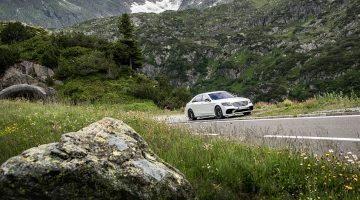 The carbon-ceramic brakes come into their own on this high-speed track, keeping things in check even as the rear of the car tries to squirm under the force of physics. With Race mode enabled (only available on the C 63 S), the full force of AMG is unleashed. The ESP is set to Sport Handling mode, which lifts the electronic reigns just enough to let you hang on the edge of adhesion through the quickest corners, without getting too sideways. It doesn’t interfere with the process of going fast, as long as you keep things tidy. And on this exhilarating but slightly scary circuit, it’s nice to have a safety net. The balance of the car is beautifully judged, allowing even decidedly mediocre drivers (like myself) to trail brake into off-camber, downhill corners and then use the throttle to point the nose exactly where it needs to go. The game is then to apply the throttle without slipping at the back. It’s really, really fun and really, really fast. The C 63 S is an excellent machine, the result of AMG treading a near-perfect line between exhilaration, luxury, comfort and accessibility. Extreme, muscular performance is readily available, and not just to the finest drivers that can eke out the limits. Our gripes are minor – an occasionally hesitant transmission, and a slight lack of feel in the steering don’t take away from the large amounts of lunacy available. Are you worried, BMW? A twin-test surely awaits.